This week on the WELSTech podcast the listener’s rule as we share some of their entries in the recent desert island software contest. Top 5 Desert Island Software Picks – Martin and Sallie discuss some of the “I-wouldn’t-want-live-without-it” software titles shared by entrants in the recent WELSTech contest. Listen to find out if you are the winner of the a $25 gift certificate to the WELSTech store (cafepress.com/welstech). Episode 070 – Are you tweeting as part of your church technology plan? Next week we’ll cover all things Twitter and take a look at what purpose it might serve in ministry in this digital age. This week on the WELSTech podcast we gear up for summer with loads of options for personal learning, and we conclude our interview with WELS musicianary Mike Westendorf. Summer Learning – Gail Potratz, our monthly guest host and Technology Coordinator at Emanuel in New London, WI, joins the conversation with Martin and Sallie, and we look at all the possibilities for learning something new this summer, including face-to-face and online, traditional and via your Personal Learning Network (PLN). (18:22) Music With A Message – Martin and Sallie continue their discussion with WELS musician Mike Westendorf about the maturity of a Christian artist into a musicianary. Get us your list via your favorite WELSTech communication channel – e-mail us, leave us a voice mail (414-375-2334), send us a message on facebook or twitter – just get us your top 5 picks! Deadline for entry is Sunday April 26, 2009 @ 11:59 p.m.
(1:04:32) Episode 069 – The contest results are in, and we share our listener’s list of desert island software picks. You’ll want to tune in to find out if you are the lucky winner of a $25 WELSTech store gift certificate. Enter to win by April 26th! Production note: Due to scheduling conflicts, this episode will have a later-than-normal release time. Look for it by noon on April 29th. This week the tech talk on the WELSTech podcast centers around group collaboration, the world of the independent Christian artist, and a geeky kitchen dream come true. Group Effort Web 2.0 Style – Martin and Sallie revisit Clay Shirky’s book Here Comes Everybody and focus on chapter 5, “Personal Motivation Meets Collaborative Production”, as they explore the power of one of the core Web 2.0 tools, the wiki. Listen for ideas on how you can use a wiki in your congregation or school. Independent Christian Artist (18:22) – WELS musician Mike Westendorf joins Martin and Sallie to talk about getitng started in the music business, the recent CIA Summit for independent Christian artist and the role technology plays in music today. Greg Letiecq shared a “He Is Risen” video clip. Find it on the WELSTech wiki, posted using drop.io/welstech. Episode 068 – It’s time to make plans for a summer of learning. Gail Potratz will join us to discuss a multitude of opportunities for personal enrichment. And we’ll wrap up our interview with Mike Westendorf. This week the WELSTech podcast goes global as Martin and Sallie discuss internet evangelism and chat with Dr. John Lawrenz from Asia Lutheran Seminary. Internet Evangelism – Playing a WELSTech version of alphabet soup, Martin and Sallie share digital evangelism tips for your church web site in the form of five “W’s” (who, what, when, where and why) and “D’s” or “Do’s” for consideration. Online worship on the WELSTech wiki – Add your congregation! 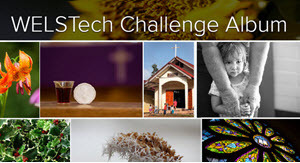 Reaching out to billions (24:34) – Spanning the globe to bring you the latest news on technology in ministry, Martin and Sallie talk with Dr. John Lawrenz about the work being done in Hong Kong through Asia Lutheran Seminary and how technology is a blessing to their efforts. Listen also for details on their newest project, the Translation Working Group. Sallie shared a link to a DIY under-the-counter PC project from LifeHacker- Stay tuned for project updates! John Shoosmith from Redeemer in Yakima, WA offered to encode closed caption videos in Microsoft Silverlight for WELS congregations, free of change. Contact John through the e-mail options on the Redeemer web site for details. Episode 067 – We’ll return to Clay Shirky’s book Here Comes Everybody and discuss chapter 5, “Personal Motivation Meets Collaborative Production”. Also we’ll share part one of our conversation with WELS musicianary Mike Westendorf. This week the WELSTech podcast is packed with April Fools pranks, a contest announcement, the latest iPhone news and loads of comments from our listeners. Time out for fun on April Fools – Martin and Sallie discuss web-based April Fools pranks, interesting sites and even a few Easter eggs. They also share info on the Conficker worm, which is set to spread today. Larry McGowan from Pilgrim in Minneapolis, MN is involved in new video ministry efforts. Gail Potratz from Emanual in New London, WI left us a voice mail follow up to last week’s Personal Learning Network discussion. We forgot to mention the WELSTech Podcast is a major contributor to our PLNs! Shelly Karstens from Peace in Hartford, WI sent us a link to the recent WI Education Media & Technology Association (WEMTA) conference she attended. Check out the PLN document shared by one of the speakers, Lucy Gray (LucyGray.org). Pastor Tim Wagner from Abiding Peace in Elgin, IL is using RSS feeds from his delicious.com account to display bookmarked sites on his congregation web page. Episode 066 – As Internet Evangelism Day approaches, we will look at new resources and ideas for reaching out in the digital age. We’ll also talk with Dr. John Lawrenz about the influence of technology on outreach and training at Asia Lutheran Seminary.